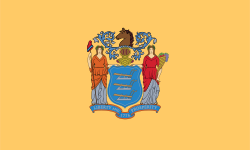 Àlà Ipò 47th ní U.S.
Iyeèrò Ipò 11th ní U.S.
Ipinle New Jersey je ikan ninu awon ipinle 50 ni orile-ede Amerika. ↑ Pursuant to a constitutional amendment approved by state voters, beginning in 2009, candidates for governor will select a lieutenant governor candidate to run on a joint ticket in the November general election. Until this procedure is effective, the President of the State Senate is first in line for succession for a permanent vacancy in the Office of Governor. Àtunṣe ojúewé yi gbẹ̀yìn wáyé ni ọjọ́ 15 Oṣù Kínní 2018, ni ago 10:26.